As i said before this blog is a compilation and summary of mystery tales/events solved and unsolved. Now, as some the unsolved events may not have any explanations to them, they might have a plausible theory as to what might have caused them. As most of my previous posts has been about archaeological discoveries i am now going to start talking about mystery events and this one is a twisted tale as it sounds like something straight out of fiction but with a plausible explanation. A Marathon runner could not have lasted the intense workout that these men and women did hundreds of years ago stated by Historian, John Waller. Theoretically though, in a modern aspects this event might have been caused by Ergotamine which is the psychoactive product of Ergot fungi (a fungi which mostly grow on grains in the wheat family like Rye) and people of the medieval era consumes a lot of grains. Ergotamine is structurally related to the recreational drug Lysergic acid diethylamide (LSD-25), and is the substance from which LSD-25 was originally synthesized. The same fungus has also been implicated in other major historical anomalies, including the Salem witch trials. John Waller speculates that the dancing was stress-induced psychosis on a massive level, since that region of Alsace was said to be riddled with starvation and disease, and most of the inhabitants were superstitious people. 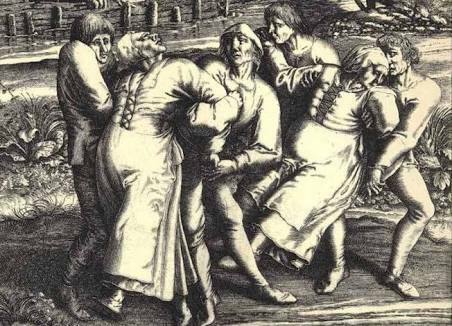 Some other cases of dancing plague were also reported in the same region during the medieval periods.